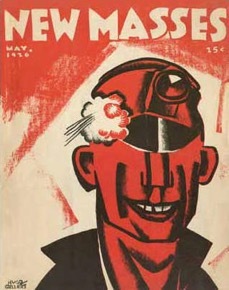 In addition to adding magazines to this database, students in various iterations of an undergraduate seminar on modernism and magazines (ENG 486) conduct collaborative research projects in modernist periodical studies. Students also engage in the practice of rethinking humanities scholarship for the digital age, increasingly adopting digital tools and platforms for their research. Charlie, Kevin, Haley, Lindsay, and Teagan scraped all the metadata from the Index of Modernist Magazines, plugged it into a spreadsheet, and conducted computerized analysis and used regressions to determine what factors influenced the lifespans of magazines. 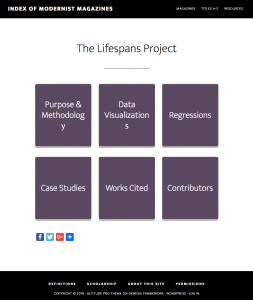 Recognizing the limitations of the data set, they also conducted case studies on three magazines. 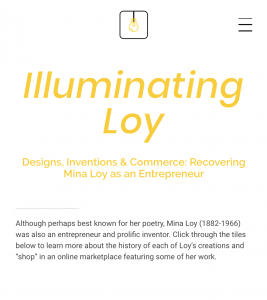 Claire Biggerstaff, Annie Maisel, Naira Oberon, and Severine Stier designed a website, complete with an online marketplace, to draw attention to Mina Loy’s work as an entrepreneur and inventor. Read about Loy’s inventions and shop for one her lampshades or other unusual designs. 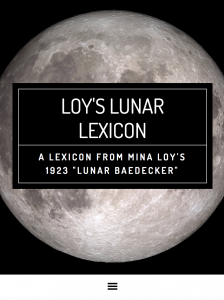 Inspired by the Emily Dickinson lexicon, Matthew Bell, Matthew Days, Casey Margerum, Hannah Sommerlad created an online lexicon from Mina Loy’s 1923 collection Lunar Baedecker, which can be used to conduct computerized textual analysis, close reading, and socio-historical investigations. See what words Loy used most often and what they meant in her time. 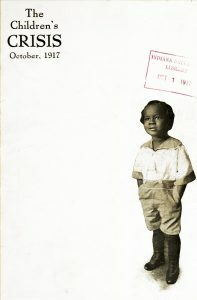 In the Fall 2015 seminar on “Modernism, Magazines & Media,” Nathan Argueta, Peter Bowman, Leigh Chandler, Audrey Lane, Wade Morgan, Andrew Rikard, and Rachel Wiltshire created a WordPress website dedicated to the Harlem Renaissance author Georgia Douglas Johnson. They read her work as it originally appeared the Crisis magazine and in subsequent books and anthologies, analyzing bibliographic codes and applying intersectional theory to elucidate complexities that aren’t apparent when the poems are read out of context. Another group in the Fall 2015 seminar, Scott Cunningham, Ryan Emerick, Eliana Ferreri, Sophia Guevara, and Hannah Grace Heartfield, researched and published an article on Atavist.com, analyzing the precisionist art published in the early years of the New Masses. They argue that the illustrations convey contradictory political meanings, both calling attention to the machine’s alienation of the worker, and contributing to that alienation by erasing the fingerprint of the artist/laborer. In the Fall 2012 seminar, “Modernism, Magazines & Media,” Abby Perkins, Eliza Hadjis, Robert Abare, Rachael Newmister, and Clint Mann departed from the focus on modernist magazines to explore the popular pulp magazine, Ranch Romances. In 1924, Ranch Romances galloped into the pulp magazine frontier, rounding up the rugged Western and the fervent romance in one crowd-pleasing 20-cent package. The magazine introduced a daring new element to a male dominated landscape: female characters—“your sister and nobody’s sister,” as editor Harold Hersey described them in his 1937 memoir Pulpwood Editor (170). Hersey’s pulp hybrid was so successful that it ran until 1971, surviving the Great Depression and WWII, and generating more than 860 issues. 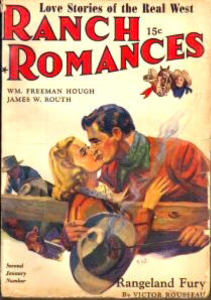 Yet despite its commercial success, Ranch Romances has been given little scholarly attention. Part of the problem is access: Ranch Romances was printed on cheap paper and designed to be consumed and disposed of quickly. We archive what we value, and academic libraries did not value the pulps enough to preserve them; the copies that remain are the province of fans and collectors. But, as David Earle’s research demonstrates, the cultural turn in modernist studies and the rise of digital archives are changing both the objects we study and the way we study them. Aided by online databases, eBay collectors, and Earle’s inspiring example, we have sought to remedy the exclusion of the pulps, and particularly female characters in pulps, from modernist studies. Throughout the semester, we have been collaboratively exploring the often enigmatic and always entertaining stories of Ranch Romances women in the 1930s and 1940s, a revolutionary period for both American women and pulp magazines. The Ranch Romances woman is a simple, yet contradictory character: daring yet domestic, impulsive yet fragile, independent yet reliant on men. She can ride horses and fight bandits with the best of cowboys—at least until she finds a cowboy of her own. Her Wild West adventures are lassoed in formulaic plot: a plucky, feisty heroine in peril, a gallant and courageous hero to save her, and a budding romance between the two. Despite the predictability of the plots, though, we found in Ranch Romances a fascinating response to the contradictory discourses—both mobilizing and restrictive—surrounding female sexuality and power that were spread in the inter-war and World War II eras. Through its non-traditional depictions of women in both fiction and illustrations, Ranch Romances gives female characters (and, to some extent, female readers) a sense of agency in a male-dominated realm. We are particularly intrigued by the magazine’s inversion of the conventional male gaze, an inversion that allows women to participate equally in looking, observing, and objectifying. We have found, however, that Ranch Romances’ progressive and independent women are ultimately domesticated: the “tiger lady,” as one story calls her, is tamed by love and marriage, and happily trades roaming the Western range for the safe confines of home. Our paper examines the course of female characters in Ranch Romances in relation to changing cultural attitudes about femininity, sexuality, and power. We hope to show why the oft-neglected form of pulp magazine deserves academic consideration, and how collaborative undergraduate research can do just that. Earle, David M. Re-Covering Modernism: Pulps, Paperbacks, and the Prejudice of Form. Burlington, VT: Ashgate Publishers, 2009. 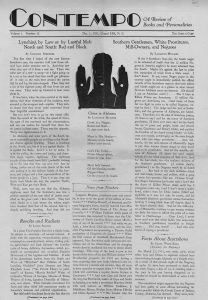 In the Fall 2010 seminar, “Modernism in Magazines,” Rachel Andersen, Zoe Balaconis, John Evans, Lisle Gwynn, Hamilton May, Josh Parkey, Susan Ramsay, Danny Weiss, and Liza Winship conducted research and wrote a paper on racial silencing in the little magazine Contempo. After the seminar, Anderson and Balaconis received a grant to investigate the Contempo Papers at the Harry Ransom Humanities Research Center in Austin, Texas. Suzanne W. Churchill built on these drafts and findings, conducted additional research at UNC-Chapel Hill, University of South Carolina, and elsewhere, and revised the argument. The resulting co-authored article was published in March 2016 in the Vol. 1, Cycle 1 of Modernism/Modernity’s print-plus platform. Youth Culture in The Crisis and Fire!! 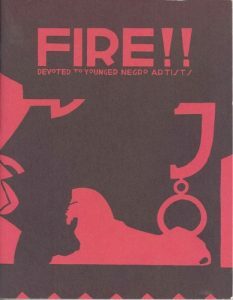 For a 2007 seminar on “Modernism in Black & White,” Drew Brookie, Hall Carey, Cameron Hardesty, Joel Hewett, Nakia Long, Amy Trainor, and Christian Williams researched and wrote a paper on “Youth Culture in The Crisis and Fire! !,” which Nakia Long presented at the Transatlantic Print Culture Symposium at the University of Delaware. Suzanne W. Churchill subsequently conducted further research, revising and developed their findings. The resulting co-authored article appeared in Journal of Modern Periodicals 1:1 (2010): 64-99.